Distinguished professor emerita of harp, Eileen Malone (1906-1999) was a legendary figure in the harp world and at Eastman. Born in nearby Victor, New York, Miss Malone earned a bachelor’s degree and Performer’s Certificate in music performance from Eastman and continued her studies with Marcel Tournier at the Paris Conservatoire and with Marcel Grandjany at Juilliard. She joined the faculty of Eastman’s preparatory division in 1930. In 1936, she succeeded her eminent teacher, Lucile Johnson Rosenbloom, as professor of harp and as principal harpist of the Rochester Philharmonic Orchestra. Her career at both institutions was long and prosperous; she remained principal harpist of the RPO for 43 years, and taught at Eastman until 1989. During that time, she made many solo appearances with orchestras, in recital, and on radio and television. She presented master classes and workshops in the United States and England, and was a successful promoter of the introduction of harp studies in the Rochester public schools. Her students have gone on to successful careers in leading orchestras and universities, and have won top prizes in international harp competitions. Miss Malone was a jury member of the first International Harp Competition in Israel, and went on to adjudicate the competition eight times more. She judged numerous competitions in the United States and Canada. 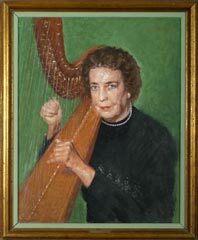 Miss Malone was a founding member of the American Harp Society (1962), serving on its board of directors from 1967 to 1973 and from 1977 to 1981. She also hosted the Society’s sixth national conference at Eastman in 1969. Miss Malone received an honorary doctorate from Nazareth College in 1982. In recognition of her service to the community and for her distinguished 59 years of teaching at Eastman, the American Harp Society honored her at its 32nd national conference in 1996. The Rochester chapter of Mu Phi Epsilon named Miss Malone “Musician of the Year” in 1985, and in 1991, she received the Fanfare Award from the Rochester Philharmonic League for her work with public school children.